With scissors in hand, Brig. 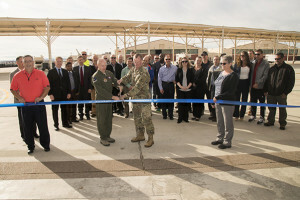 Gen. Carl Schaefer, 412th Test Wing commander (left, and Army Col. Kirk Gibbs, U.S. Army Corps of Engineers Los Angeles District commander, prepare to cut the ceremonial ribbon signifying the official opening of the new 411th Flight Test Squadron facility March 22. The squadron is responsible for the developmental testing of the F-22 Raptor and its systems. Moving into a new house can be a daunting task, but imagine moving an entire squadron with almost 350 personnel, fighter jets and maintenance and communications equipment, into a new flightline test facility in one year’s time. 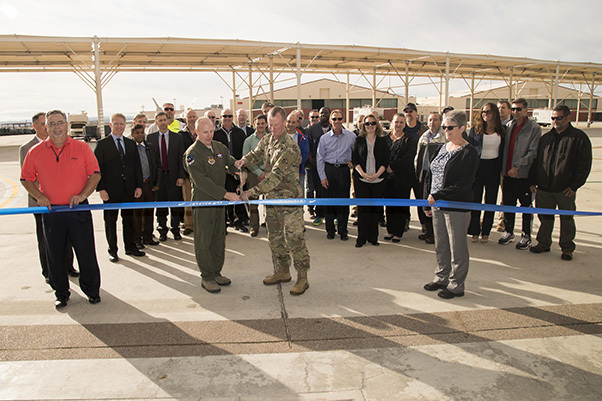 The completion of that task and the spirit of teamwork was celebrated March 22, 2017, with a ribbon-cutting ceremony at the new home for the 411th Flight Test Squadron, at Edwards Air Force Base, Calif. The squadron had overseen the developmental test and evaluation of the F-22 Raptor and its systems for 24 years at its old location on Ramp 11. The construction contractor and base units were able to make the project’s 365-day deadline two weeks ahead of schedule. The effort involved extraordinary teamwork and hard work to ensure F-22 flight test operations were not hindered while still meeting the movement task, leadership said. The new 411th FLTS and the F-22 Combined Test Force facilities on Ramp 7 used to be home to the 416th Flight Test Squadron, which has since moved operations to Bldg. 1199 on the flightline. 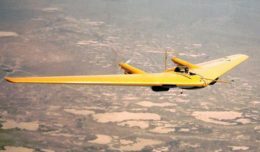 The shuffle in squadron locations came from a decision made in December 2015 by base leadership to make way for future test programs coming to Edwards, according to Larry Wolford, 412th Test Wing Strategic Planning program manager. The 412th Test Wing and 412th Civil Engineering Group worked with the Army Corps of Engineers to award a contract to a construction company who renovated the 411th FLTS’ new facility, which has seven buildings and three hangars. New floors, roofs and electrical systems were installed as well as new fire suppression systems. After all the construction was done, the F-22 CTF began their physical move of office personnel, computer systems and furniture Jan. 3, which they finished up mid-February. “When you ask the F-22 members, it’s a lot better than where they were,” said Wolford. Staley and Sally Scheuer, F-22 CTF, business lead, both said the move provided an opportunity to rearrange office space to maximize efficiency in their new work areas. “Most people in the CTF will tell you they like how everything is arranged now. We had a CTF director with a good vision of how he wanted things and put everybody in the right places. The people who have to function together are together,” said Scheuer. Another challenge during the moving process was movement of F-22 CTF specialized computer systems and the need for new information technology infrastructure at the new location. According to the 412th CS program manager Mike Leonard, their JT3 team members installed 350 new phones along with 4,000 data jacks. They also installed 293,000 feet of copper wiring and 43,000 feet of fiber optic cable in preparation for the relocation.